After the Halloween snowstorm of last month, we've had warm, mild weather. 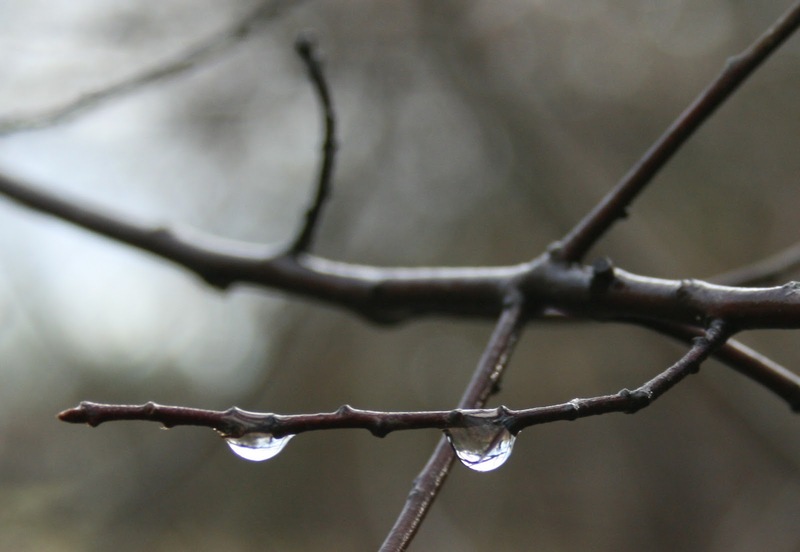 The nighttime temperatures have dipped below freezing a few times, but mostly it's been warm. Insects are still flying around. Beaver are still freely swimming in open water and chewing exposed tree trunks on land. The cilantro in the garden is still lush and aromatic and tasty in pesto. People are jogging and cycling and hiking in light clothing, some are in shorts. Everyone is smiling and thrilled with the warm weather. Thanksgiving weekend was pleasant to be outdoors. We made a fire pit in our yard and sat around a campfire in the evening, barely needing a coat. This all sounds and feels so wonderful. Yet something needles in the back of my mind. This is not really that good. It should not be this warm on the cusp of December in New England. I don't really want insects flying around right now - some of them are pesky and should be killed by cold temperatures by now. 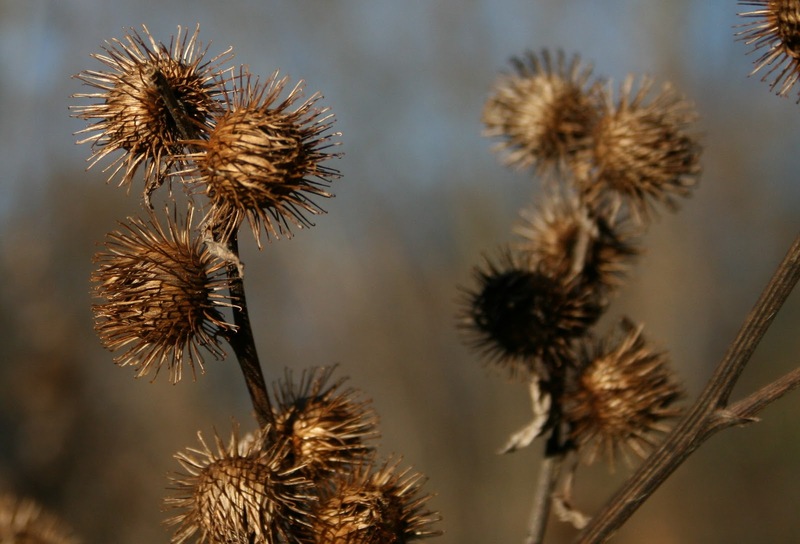 Next year we may see a surge in invasive plant and animal infestations that do well as the climate warms. So, I worry some, while enjoying the foggy mornings, mild afternoons, and pleasant evenings. 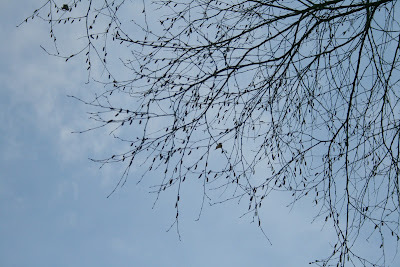 I just hope plants don't start budding too soon and the migrating songbirds keep heading southward. 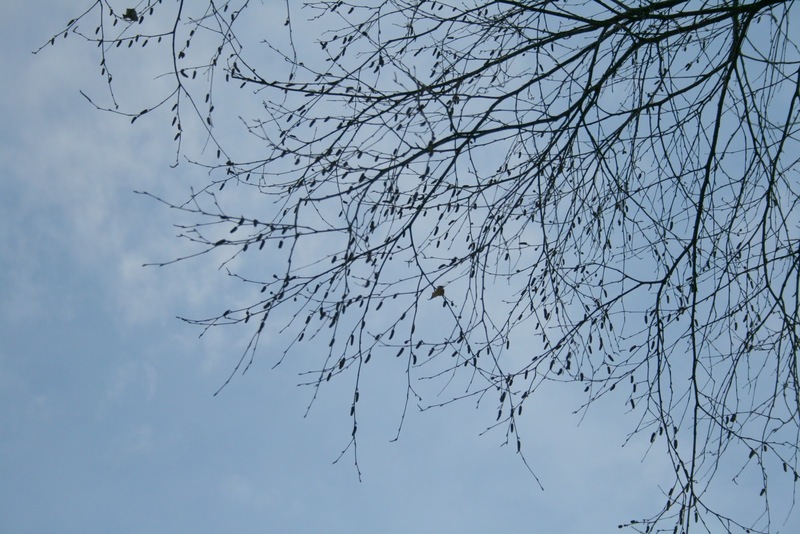 Have you ever seen a thick bundle of twigs in a shrub or tree? These are "witches' brooms" -- the term apparently comes from the German word Hexenbesen, which means to bewitch (hex) a bundle of twigs (besom). 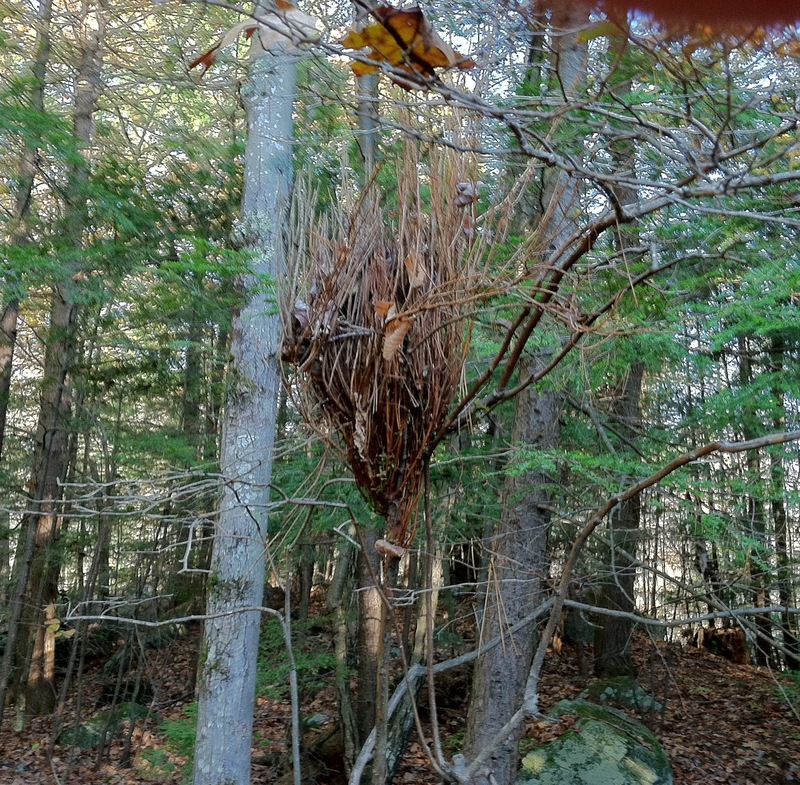 The idea of a witch riding a bundle of twigs has waned, but the name remains, and maybe the idea too thanks to Halloween and Harry Potter. Anyway, back to the bundle of twigs. 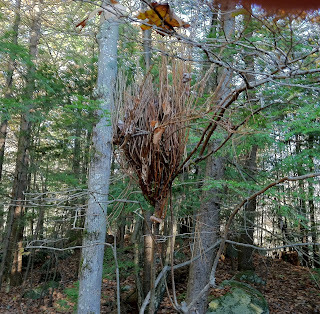 Most any woody plant can form a witches broom, sometimes they are inconspicuous and sometimes obvious. I notice them a lot on wild highbush blueberry bushes. Abnormal shoot growth results in this mass of twigs from a single point on the plant. The causes vary and include fungi, parasitic plants, insects, environmental stresses, and sometimes mutations. The broom on highbush blueberry is likely caused by a rust fungus, Pucciniastrum goeppertianum. Rust fungus have a secondary host, and in this case it is balsam fir. So, if you are trying to grow these two plants, best not to have them near each other. 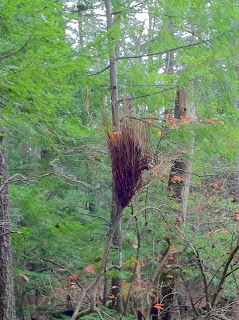 Yet another fungus -- commonly known as yellow witches' broom -- infects balsam fir, with chickweed as the secondary host. 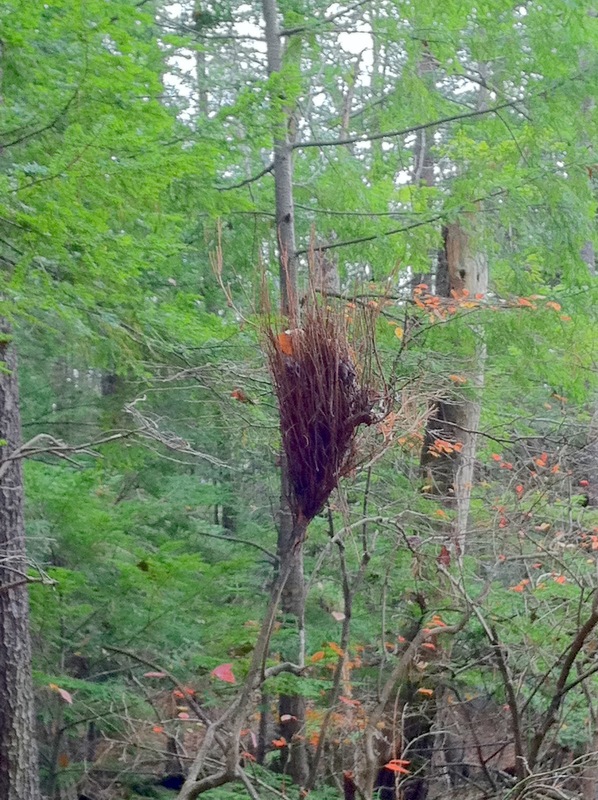 Some witches' brooms are caused by mistletoes or dwarf mistletoes, parasitic plants that cause a similar reaction. You might see these in softwoods. These are rather mysterious phenomenon, the causes are not always known for a given broom. A broom here or there on a plant will not kill it, so just another interesting part of nature's diversity. A brisk, beautiful, blue-sky day. The oaks dropped a lot of leaves today, whisked away by the wind. If you bundled up against the wind it was a great day to be outside. Having a dog helps. 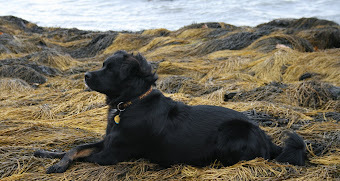 Kodi begs to be outside and it doesn't take much coaxing to get me to go for a jaunt somewhere away from my desk. At one point today we ended up at Wagon Hill Farm, a nice conservation area on the shores of the Great Bay Estuary in Durham, New Hampshire. There are sweeping views of the Bay, stands of arching oaks, and large fields mowed late in summer to allow birds to nest and forage. Bluebirds chirp from a few remnant apple trees. We made our way to a narrow point that juts out into the Bay. Wave action and a bit of overuse by humans is causing this sandy point to erode away over time. Still, it is a favorite little spot, in part because of the pitch pines. A dead pitch pine with live pines behind at "pitch pine point"
Pitch pine (Pinus rigida) is a beautiful native pine (okay, another one of my favorite trees), that does well on sandy soils. 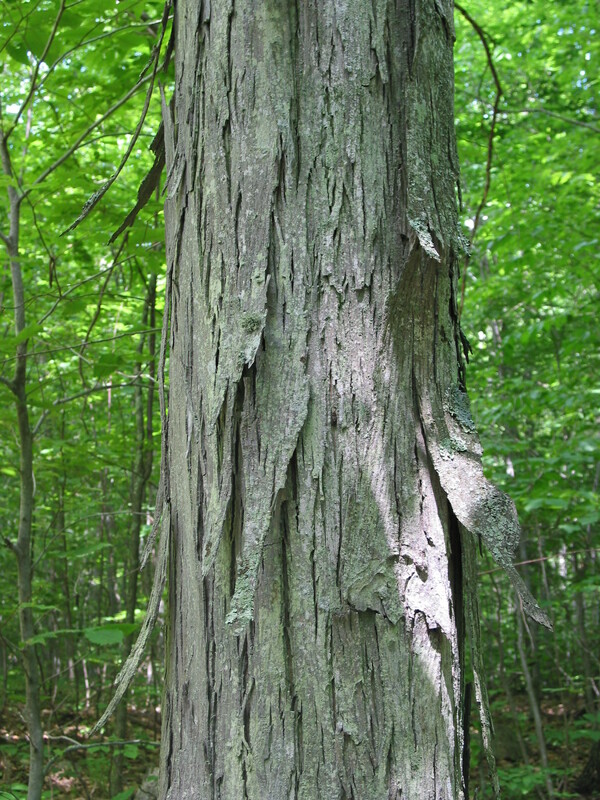 The tree is well-adapted to fire: bark with thick plates and deep furrows, seeds that readily germinate in soils exposed to fire, and epicormic branching -- shoots grow from the bark (especially if the crown is killed by fire). Some of the squat, stiff cones are serotinous, remaining closed until the heat of a fire melts the glue that holds the cone scales tight. 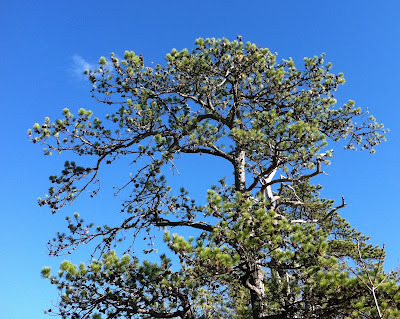 Fire is now curtailed in most places within the pitch pine range in the eastern U.S., allowing other trees to encroach and eventually overtake pitch pine. Some of the best examples of pitch pine are in "pine barrens," in New Jersey, Long Island, and Cape Cod. Here in New Hampshire, the Ossipee Pine Barrens are managed (using prescribed fire) by The Nature Conservancy. A map and guide of the hiking trails at their reserve is available here. In addition to the pitch pines, these barrens harbor rare moths and butterflies and birds that are in decline including whip-poor-wills, common nighthawks, and rufous-sided towhees. Elsewhere you might fine a pitch pine here and there. 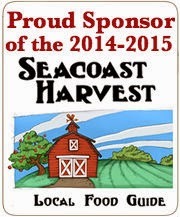 Look for them as you hike throughout New England and points south. 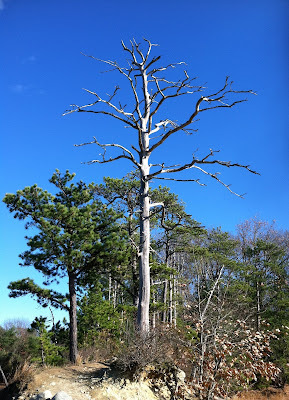 Here are some more photos from the pitch pine at Wagon Hill. 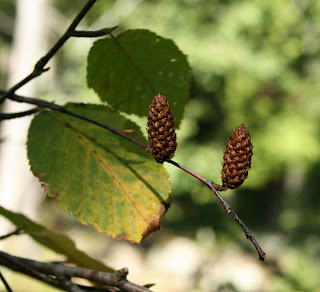 The bark and the cones should tip you off that it is a pitch pine. Another key feature is the 3 needles per bundle. 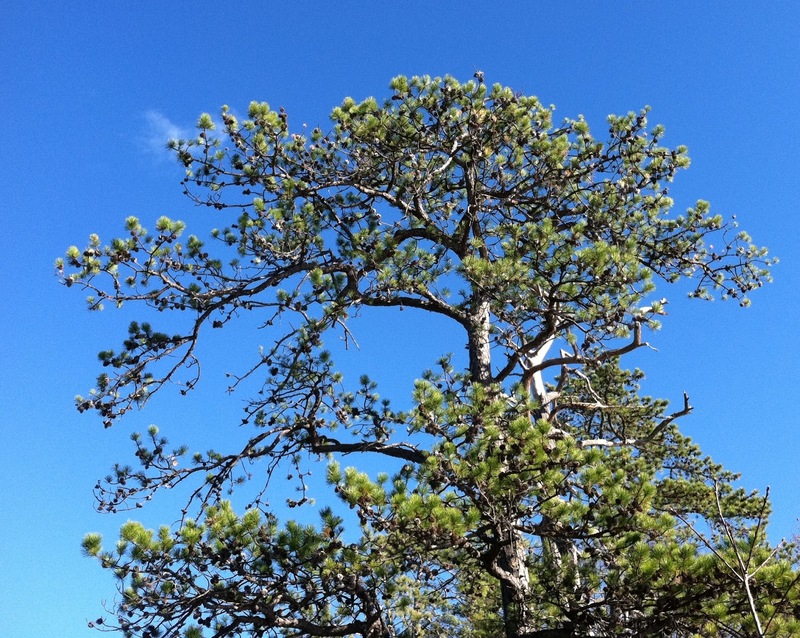 The other native pines that you commonly see in New Hampshire are the white pine (5 needles) and red pine (2 needles). 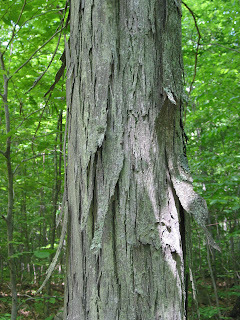 The thick bark is evident in this photo from a different day. Pitch pine often takes on a bonsai appearance, another interesting trait of this beautiful tree. Some days you long for something bright and beautiful in the woods, to flush away a gloomy mood or break the monotony of a gray day. Today was one of those drab, drippy days, nothing special going on, except for the drone of dreary news on the radio. Here is what cast away any glum thoughts I had today - a bright and beautiful flower-fruit stalk of the red-panicled dogwood (Cornus racemosa). A panicle is essentially a multi-branched flower. Doesn't it just lift your spirits, with its bright red panicles? The white fruits of this dogwood are loved by birds, so not a one is left on the shrub. Another name for this shrub is gray dogwood. Now you see why I prefer red-panicled! It is often found in moist soils in swamps, along streams, or in other wet places. Sometimes it does well in drier places too. It makes a nice yard shrub, but forms a thicket so give it space. 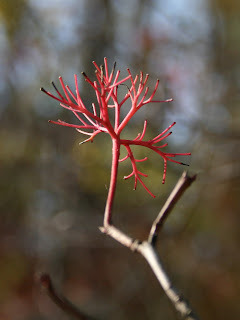 We have other common dogwoods in our woods and wetlands including silky and red-osier, but look for the red panicles and you'll know what you've got. And it will brighten your day. It's been said that if you see a Leopold bench in someone's yard you know something about the people that live there. Aldo Leopold (1887 - 1948) helped launch the conservation movement in the 20th century through his inspiring work and writings. You can read an earlier blog that I posted on Leopold's Legacy last spring. In 1935 Leopold bought an old farm along the Wisconsin River in Baraboo, Wisconsin; with his wife and five children he restored the prairie and woods to the overworked land. "The Shack" as the farm was known is where he pondered a "land ethic" and "land health." He built a simple, but elegant bench from four pieces of wood, a bench that he must have spent many hours on contemplating the relationships of people to each other and to the land. I learned more about Leopold's bench from my friend Carl Wallman, who owns Graylag Cabins and Harmony Hill Farm, and is chair of the Northwood Area Land Management Collaborative (NALMC). Carl hosted a Leopold bench making workshop in October -- read and see highlights of the workshop here. I could not attend the workshop, but recently Carl showed me how to make one and provided me with sturdy 2-inch thick hemlock from his property. This bench went to my parents at their Winterberry Farm. They inspired me to be a conservationist and I wanted them to have my first Leopold bench.